The first night we opted to stay in and make dinner at home. 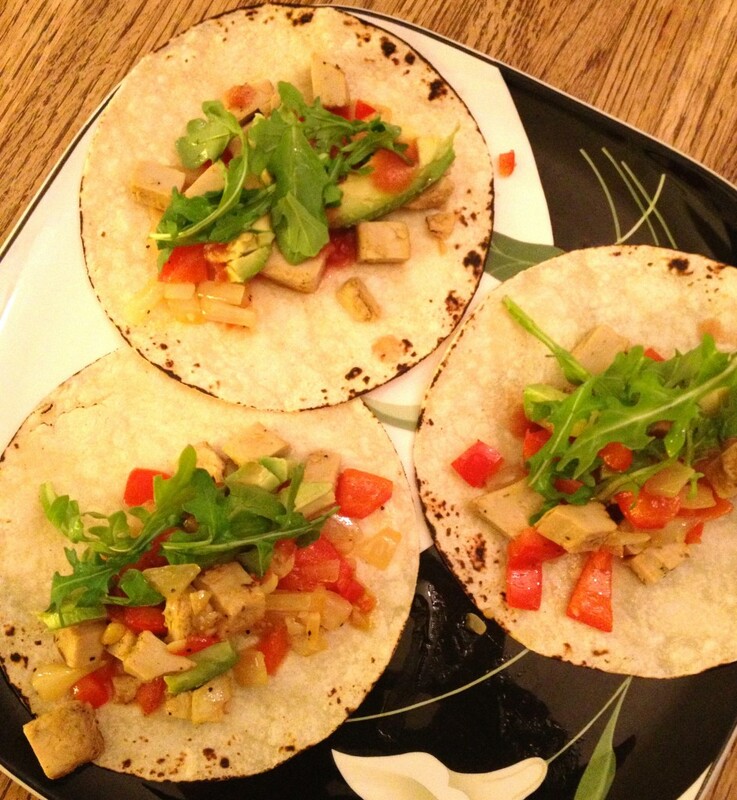 It was a simple, yet delicious taco recipe. I sautéed some onions, garlic and bell peppers, added chopped Beyond Meat chicken then topped them with avocado and spring mix. Yum. 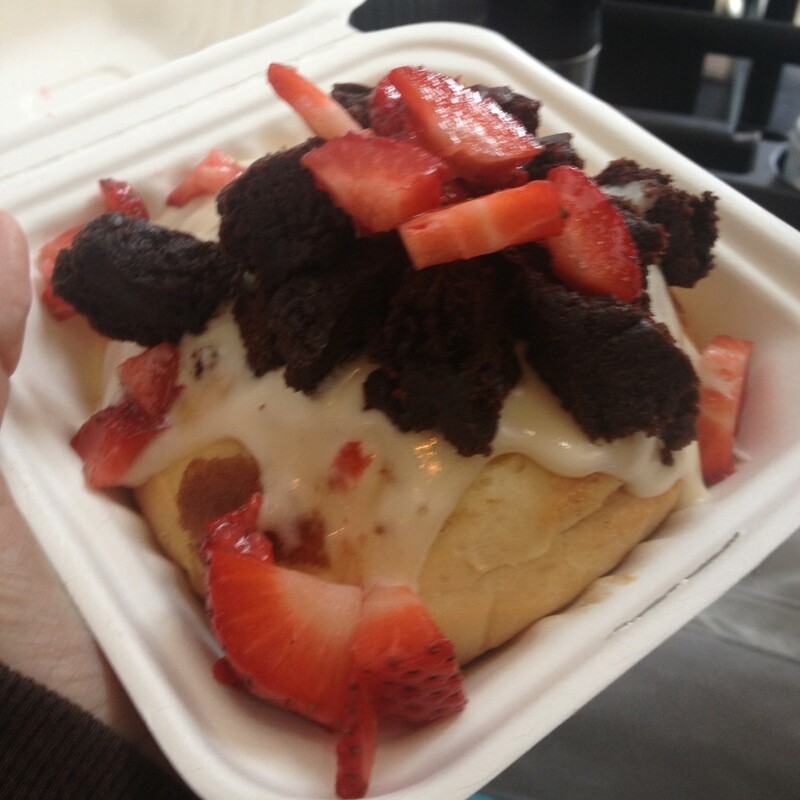 The next day I was on a mission to get to Cinnaholic. I have been hearing and dreaming of this place for the past couple years. 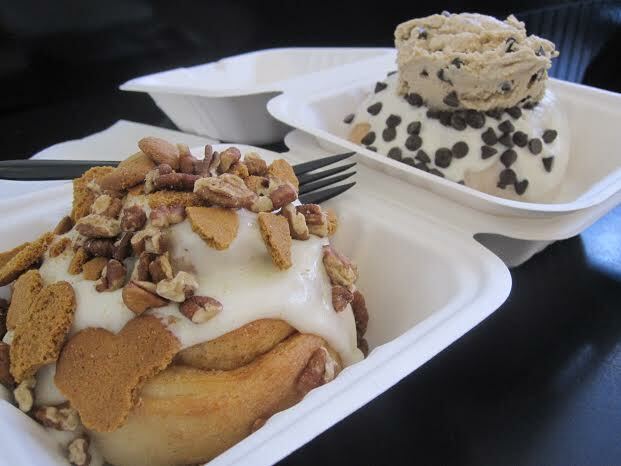 A vegan cinnamon roll bakery where you can build your own creations, kind of like a Cold Stone for cinnamon rolls. The first time we went (yes, we went more than once!) I ordered the pumpkin spice frosting, ginger snaps and pecans on a standard roll. My bestie (please shoot me for using that word) opted for the Chocolate Chip Cookie Dough which came with chunks of raw cookie dough on top. These babies were out of this world! I could only manage a few bites they were so rich and delicious, and it was just as good when I finished it off later in the evening. The second trip was on a Saturday and the line was out the door. Not surprising, now knowing how frickin mind blowing these cinnamon rolls are and I was more than happy to wait for my next creation: almond frosting with brownie chunks and fresh strawberries. Again it took me almost all day to finish it, because the rolls are huge! I am a true fan and have been suffering withdrawals ever since leaving Berkeley. Sorry for the blurry phone pic. Right after Cinnaholic we walked down to the brand new all vegan shop called Republic of V. This space was super cute and packed full of vegan food and merchandise. 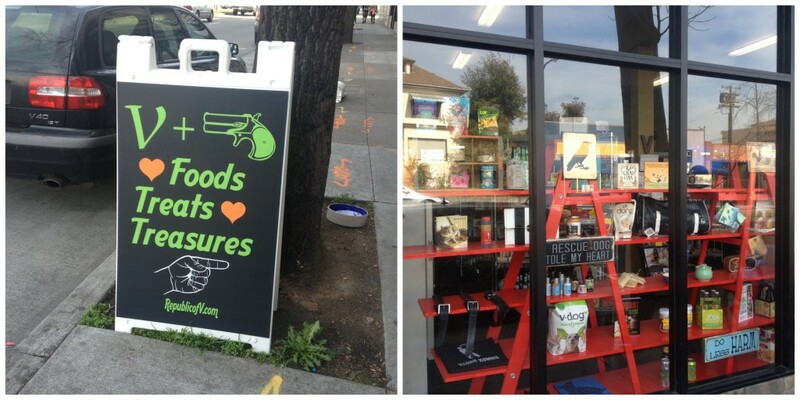 If I had a million dollars I would have purchased everything in the store, but I played it conservative and went with an Herbivore t-shirt and a bag of Beanfields chips. The next day we spent in San Francisco helping out in her husband’s office. For lunch we walked over to Osha Thai near Union Square. You can order off the menu or choose from pre-made dishes at the counter, giving a quick look at the vegetable options, I asked if they contained fish sauce to which they replied yes. Feeling a little defeated I started to look at the regular menu and nothing was popping out at me when a young woman working there came over and asked if I wanted to see the vegan menu. Um, hells yeah I do! I was so excited for two reasons: 1. I was starving and really wanted thai food. 2. The instinct this woman had to ask if I wanted a vegan menu was amazing. I ordered spring rolls and fried rice, the BFF ordered a drunken noodle of sorts. Everything came out hot and delicious. The flavors were bright and fresh and the tofu was cooked to that perfect crispy on the outside/tender on the inside combination. Had we been in the city more that week I would have probably come back to this place again. 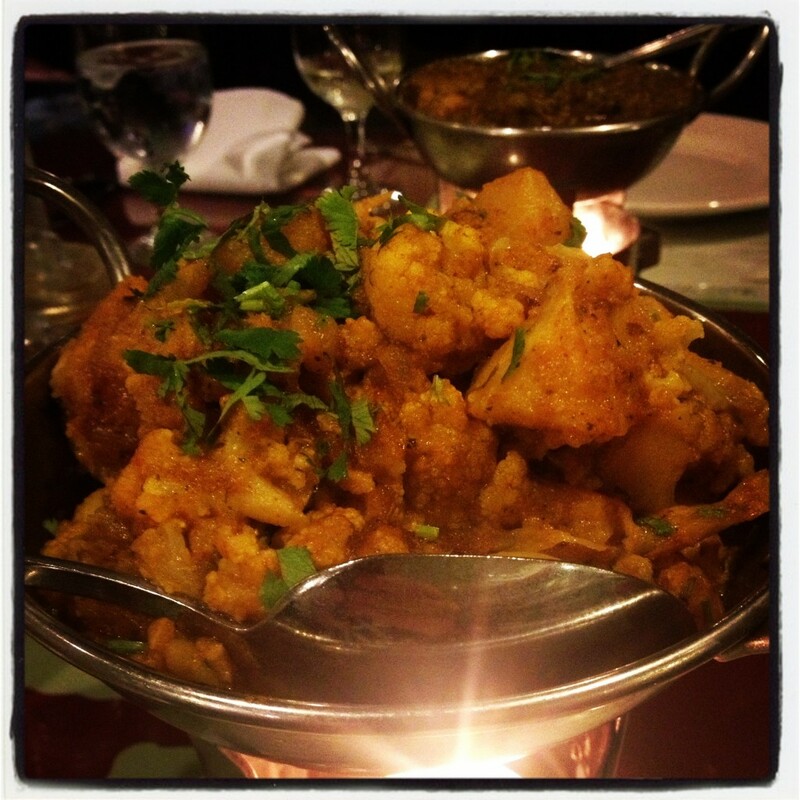 There was also a trip to Saroor Indian restaurant in Walnut Creek during the week so I could calm my unnerving craving for Aloo Gobi (my favorite Indian dish ever). This place was off the beaten path, but the service was very friendly, the food was tasty and the wine was cheap! On my last evening there I made a pretty spectacular endive appetizer that I had full on plans to photograph and blog about separately, but unfortunately the pics turned out awful. In good blogger conscience I just couldn’t post it, so I plan on remaking that dish in the next week or so and snapping some good pics and posting the recipe, so keep an eye out for that! Before heading to the airport we swung by Berkeley again to check out Saturn Cafe, an all vegetarian (with a ton of vegan options) diner. I ordered a mimosa, french fries and black bean taquitos. 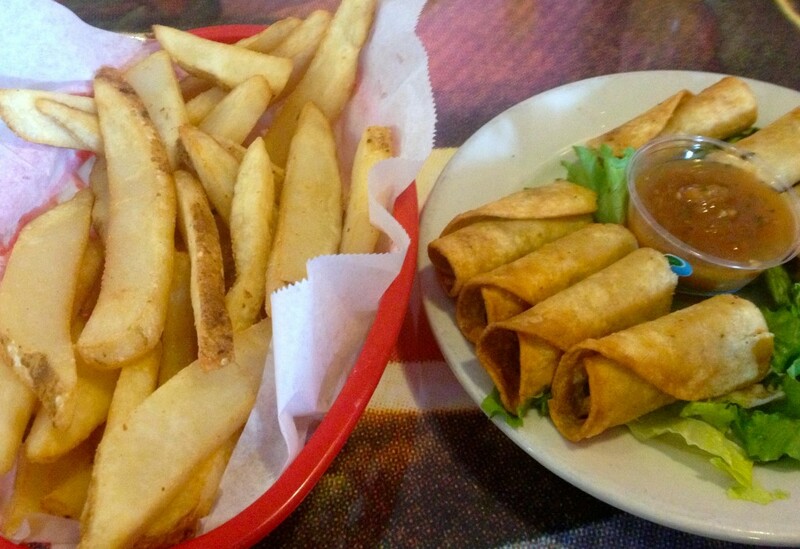 The fries were good, but I was a little underwhelmed by the flavor of the taquitos. They were fine dipped in salsa, but on their own a bit bland. I regretted not ordering the Vegan BBQ Ranch Chicken Burger…but I will just have to save that for next time! That’s it folks! I’m really bummed we didn’t make it to Millennium in San Francisco, but I am determined to make that my first stop next time I’m up in the city!